This 1599 map by Dutch navigator Willem Barentsz is the first to map Spitsbergen since the Vikings discovered it several centuries earlier. The exact origin of the expression “to draw a line in the sand” is unknown. Some say it stems from the invasion of Egypt in 168 BC by Antiochus IV Epiphanes of Syria whereas others argue that it is associated with the Battle of the Alamo. One of the most popular origin stories is that it is derived from John 8:6 in which Jesus draws a line on the ground while addressing those eager to stone a woman accused of adultery. That the expression moved from the more tangible “ground” in the Bible to the more ephemeral “sand” in current use, is perhaps fitting. While humans have a tendency to fix firm boundaries and expect no one to cross them, the historical record is testament to just how fickle and fleeting such lines in the sand can be. Inherently dynamic and temporally limited, the capricious nature of lines is noticeable in any discussion of the Arctic. As the circumpolar north has increasingly come to the fore of international relations, such discussions have taken many tones. Will conflict break out over unsettled boundaries? Will a revisionist power seek to change existing delimitations? While definitive answers to these questions are not found in the past, examining how we got to the present can provide insight into long-term trends. A different view of the world! and shows the geology of everything above the Arctic Circle. European powers, obsessed with the idea that there might be a shorter passage to Asia through the North American landmass, had long held an interest in the Arctic. In the areas where solid land existed, the normal (European derived) rules of acquisition of title applied. To be sovereign over a slice of the new world, the European powers had to demonstrate both the corpus and animus occupandi—the ability and intention to exert power over a given piece of land. To prove that a state had the ability to control a given territory, they had to demonstrate the “colonial effectivités” (sovereign activities) required. This normally manifested as proof of administrative control such as deed registration, tax collection, and the licensing of professions. A century later the Dominion of Canada, eager to shore up its claims to the Arctic Archipelago, relied on a similar mixture of discovery, occupation, and uncontested claims. 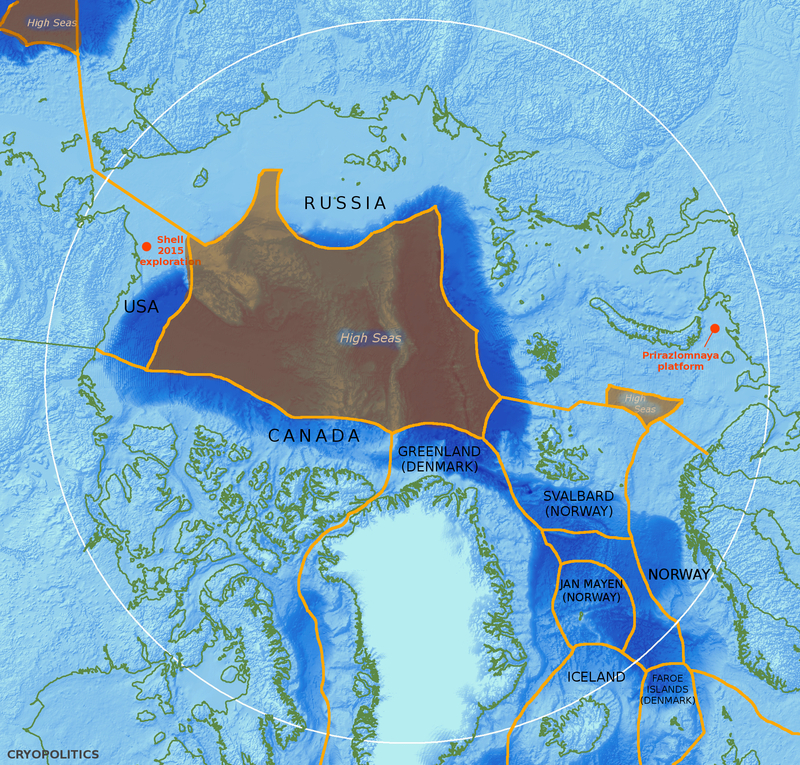 What’s up with Canada’s Arctic maps? Arctic Yearbook editor Heather Exner-Pirot walks us through the weird world of Canada’s eccentric northern cartography. How the Arctic Ocean and the extended icepack would be divvied up was a trickier question as effective occupation was not an option. Instead, a new approach reminiscent of the Papal Bulls that divided the new world emerged: the sector theory. This theory was first proposed in public in a speech to the Canadian Senate by Pascal Poirier, a Senator, in 1907. The sector theory was simple: draw straight lines from the land boundaries of the respective Arctic countries, across the ocean and the ice, to the North Pole—this would be the new division of the Arctic. It should be noted that Poirier believed that Canada’s claims to the Arctic relied on other forms of title first and foremost; the sector theory was only a fourth element. Despite receiving a cold reception in the Canadian Parliament, the sector theory drew much attention in the interwar period. This was, in part, due to a decree released by the Soviet Presidium in 1926 that based its claim to Arctic lands on the basis of the sector theory. Proponents of the theory, both Soviet and otherwise, rested their claims on rather fragile grounds. They argued that a sectoral approach would ease tensions between Arctic states and that it was simple, practical, and inevitable. Opponents fiercely opposed this approach, saying that it reversed the traditional order of acquisition of title: how can a state lay claim to something it knows nothing about? Many saw the sectoral approach, based as it is on the idea of contiguity, as a perversion of the now discarded hinterland doctrine. While the Arctic was militarized during WWII and remained so during the Cold War, an awkward legal status quo persisted with the Soviet Union maintaining their sectoral approach and the United States choosing a more conservative, at times disinterested, approach to the issue. In the 1990s things took a turn towards cooperation with the two superpowers negotiating maritime boundaries in the Bering Strait, Bering Sea, and the Chukchi Sea. As with the hinterland doctrine during the scramble for Africa, the sector theory passed out of usage. In its place, states reverted to the traditional means of demonstrating title for territory and turned to the United Nations Convention on the Law of the Sea (UNCLOS) to resolve the maritime aspects of the Arctic frontier. 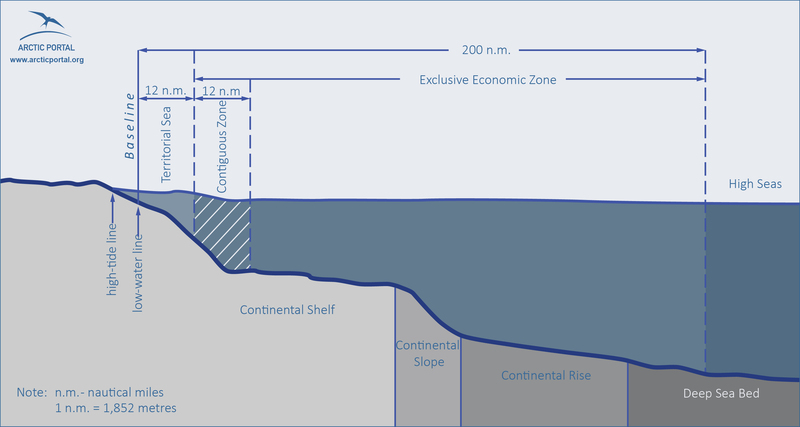 the exclusive economic zone and the international waters. Of the Arctic countries, all but one has ratified UNCLOS. The sole objector, the United States, nevertheless considers the key provisions of the “constitution of the seas” as customary international law. 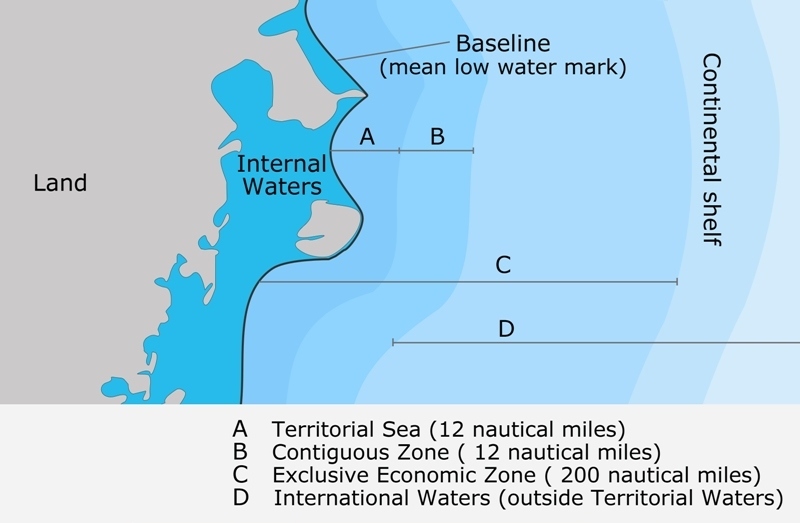 States are allowed to claim a twelve-nautical-mile territorial sea, a 200-nautical mile exclusive economic zone (EEZ), and the possibility of exercising sovereign rights over an extended continental shelf beyond 200-nautical miles if it can be considered a “natural prolongation” of the coastal state’s landmass. Extensive data is required to support such claims, which are then processed by the Commission on the Limits of the Continental Shelf—a commission of scientific experts. In case of overlap or conflict, treaties have become the primary means of finalising boundaries and, in the minority of cases, boundary disputes come before third-party dispute settlement mechanisms. Although but a brief overview of the evolution of how states have drawn lines in the Arctic—and one that omits the suppression of Indigenous ways of understanding the Arctic—several patterns can be tentatively teased forth. Of particular note, where different visions of the region have co-existed, there has been no resort to the use of force even where the capacity to do so existed. The Soviets, for example, eventually peacefully relinquished their approach derived from the sector theory. Instead, successful boundaries have been those fixed by rendering the Arctic knowable through administration, maps, and data. When on land, these boundaries were decided by proving effective occupation of a territory. Maritime boundaries, for their part, are being delineated through data provided to UNCLOS—at least for the time being. Could it be that, going forward, states will eschew revisionism and stay the cooperative course? History, of course, cannot answer this; but it does provide interesting food for thought.